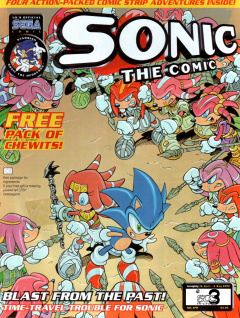 Sonic the Comic #179 is the one-hundred and seventy-ninth issue of the Sonic the Comic series by Fleetway Editions Ltd.
Back down in the Emerald Hill Zone, Porker is running a few tests on Sonic, trying to find out why coming into contact with Chaos has turned his eyes green. Sonic impatiently steps off of the apparatus, complaining that he feels fine, likes having green eyes and is more concerned about the Chaos Emeralds, showing no concern over a violet glow he kept seeing before. Knuckles is desperately trying to find the Emeralds, but he doesn't know that Dr. Robotnik is blocking all the Emerald signals from the dark dimension. Sonic starts seeing the violet glow again, this time right next to Porker, but neither Porker nor Knuckles can see it. The glow then morphs into the image of a female echidna who, without warning, zaps Sonic with a blast from her staff, causing him to disappear in a puff of smoke. Graphic Zone: Fan art submitted by readers. The theme for this issue's Graphic Zone is "Easter Egg-citement! ", featuring egg=themed pictures. Owners of the printed art each won a Sonic the Hedgehog digital watch. This page was last edited on 19 March 2019, at 15:06.